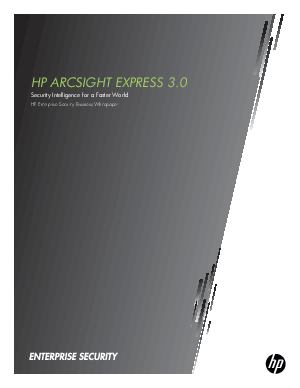 The HP ArcSight Express ESM solution contains the new ArcSight Correlation Optimized Retention and Retrieval (CORR) Engine, a breakthrough technology that delivers industry-leading performance in log correlation and storage within a single, simple, easy to deploy solution, enabling you to rapidly thwart the complex attacks your organization faces today. Detect more incidents and address more data – The new CORR Engine, which processes millions of events in real-time, allows you to focus on more complex attacks. Express will scale from simple, out-of-the-box use cases to complex scenarios so you never have to worry about outgrowing your solution. Operate more efficiently – A common data-store allows both the real-time correlation application and the log-management application to use the same set of data, providing a seamless workflow that includes detection, alerting, forensics analysis and reporting. And a new, customizable management console simplifies administrative tasks, providing integrated case management, workflow escalation, and drill-down capability to assist in all phases of the incident handling process. To learn more about Express, download this complimentary whitepaper NOW!